Hello all! It's that time again! 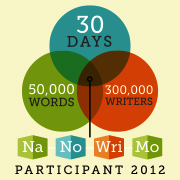 NanoWriMo is upon us! As a rule of thumb, I'm very selfish during the month of November. It's all about my writing and my characters. Please be gentle on me if you don't see me around the blog world. I'll try to still post the opportunities, but more than likely I'll be too busy writing. In the past, I've written some posts on what you need in order to be prepared for NanoWriMo and also what I've learned from NanoWriMo. I will recap with a brief list today, but if you would like to read a more detailed post, click the links above. Good luck to all those participating! 1. BACK EVERYTHING UP IN MORE THAN ONE PLACE. 4. Reach out to other writers that are also doing NanoWriMo. 5. If You do get behind, remain calm. You can always catch up if you really want to. Love the look of your blog BTW. I'm looking for inspiration for a blog facelift and I love this. Thanks for this! I'm doing NaNo for the first time this year so I can use all the help I can get. :) Happy writing!